European Competitiveness Pact: A breakthrough or a Red Ocean doom? The European Competitiveness Pact is the latest proposal raising havoc among European Union members. Spearheaded by Germany and France it has been portrayed as a remedy to problems behind EU periphery’s debt crisis but also as precondition to much needed easing of their bailout terms in what has been bluntly dubbed as the “Grand Bargain”. Sounds like euphemism in a way: what should have been an ambitious plan to push forward development and growth across European Union, it is mainly limited to restrictive fiscal policy, let alone promoted as a restrictive, punitive deal that causes public resentment. Furthermore, the introduction of a common policy apart from taking away power from national governments, a sensitive issue, risks creating uniformity across EU member states to the extent that doesn’t exist even in the US. This may increase correlation among European economies and take away a useful internal decoupling mechanism. 3. Minimum rate for investments in research, development, education and infrastructure of x% of gross domestic product (value to be decided). 6. Establish a national crisis management regime for banks. Much can be said about each one of these metrics, the culprits targeted and their potential effectiveness. The common corporate tax basis for example is directed to Ireland’s low corporate tax rate (Irish claim is key to their growth), wage indexation is practiced in Portugal, Belgium, Greece as is lose fiscal policy and high indebtedness (but then again not only by them). Trying to decode motivations behind the Pact one can appreciate Germany’s concern over allowing certain economies to roll back into the same crisis and require further bailouts in the future (much discussion has been done on moral hazard these days). On the other hand one should also be critical of these measures’ results and effectiveness. In this posting we’ll focus on wage levels; after all deficits, public debt, social security and taxes are all related and have reached their limitations in several countries. Analyzing the labor cost we will address certain misconceptions and through that show why this Pact might be missing the mark in raising competitiveness where needed. Comparing labor costs across Europe and other developed countries it’s clear that wages in the European South are much lower, both on gross and net basis. Another interesting finding is that divergence between the Northern and Southern Europe figures is much higher on gross salary basis than on GDP per capita or net salary figures. This could be due to higher salary deductions in Northern Europe as well as higher levels of self-employment or unreported economic activity in the South. Even in the case of potential tax and social security contribution evasion the solution can’t only be lowering labor cost but rather taking corrective actions where needed, to boost state income and reduce liabilities over a period of time. Wage level is not the main parameter affecting competitiveness; equally important is what’s produced with this labor cost. 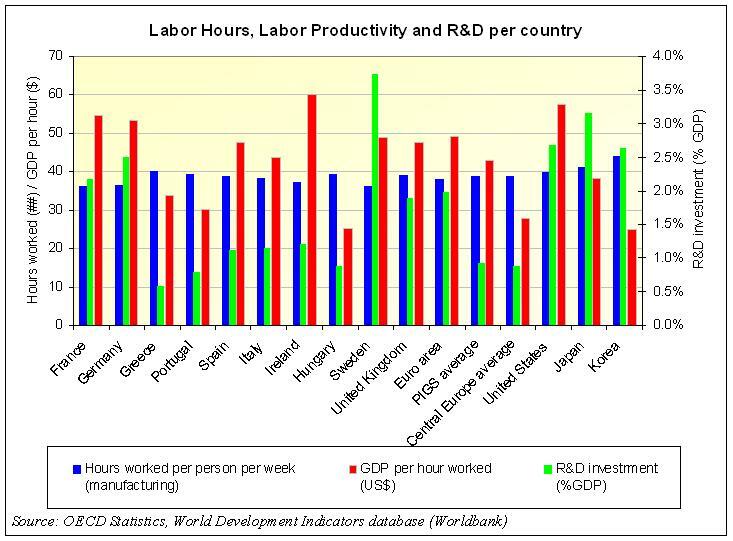 Looking at labor productivity across Europe, US and Asia we can see that Southern Europeans are working more hours than their Northern counterparts; contrary to stereotypes and prejudices repeated on various occasions. At the same time however they produce much less of what produced in Northern Europe in terms of output value (GDP per hour worked). Productivity is probably even lower from official figures if illegal labor is taken into the equation. Low productivity can be attributed to inefficient production methods, low value added products, as well as restrictive legislation and other structural problems. Looking at the Greek economy for example, it is being characterized by services while Germany’s by high value added/export oriented technology sector. Greece is also suffering by a non-conducive to businesses legal framework and economic environment, as international rankings show. What’s the reason for that is a separate discussion, but it’s not a labor cost problem. A straightforward expression of lower competitiveness can be found in the South’s much lower R&D expenditure. Undoubtedly these are economies that are coming from different starting points and move with different speeds. In the absence of no intervention these differences will persist in the future. To be fair, the European Union has been trying for years to promote economic development across its members. The 2000 “Lisbon Strategy for Growth and Jobs” called for increase in innovation and employment over a ten year period. A minimum 3% R&D expense target across all Europe was set then which was not finally attained even by highly developed economies. The program also didn’t reach its employment targets. Some reasons for that was the difficulty in steering centrally planned policies through national governments and politicians that may have different priorities or capabilities. Maybe the reason of this failure lies in the root of the European economic system that favors public investment and crowds out private investment discouraging this way productivity gains; the usual objection to Keynesian policies. This phenomenon can be more evident in countries that are trying to catch up and usually lack a robust private sector: investment might end up in public projects of questionable utility that although may help in increasing wages and GDP, they don’t contribute in raising competitiveness and promoting long term sustainable development and growth. In any case R&D investment, on its own, is not a panacea. To be effective it requires the existence of research infrastructure, know-how and a sizeable pool of R&D personnel, otherwise it will be money thrown out of the window raising more excuses against good intentions. Moreover it requires the existence of a business environment that will nurture innovation which cannot happen in economies that lack respective infrastructures. Researchers cannot produce in vacuum; students won’t be inspired without real life stimulus, role models and most importantly opportunities to work and grow professionally. Automobile research for example makes sense when carried out close to an established production base where scientists can have immediate access to automobile production, testing facilities and specialists to exchange views on a frequent basis. Marshal plan worked where there was an infrastructure to leverage; on the other hand, much higher foreign aid has failed elsewhere. Apart from technical infrastructure the financing capability should be there as well: next to Silicon Valley’s vibrant startup community stands a robust venture capital sector capable to lend a helping hand. 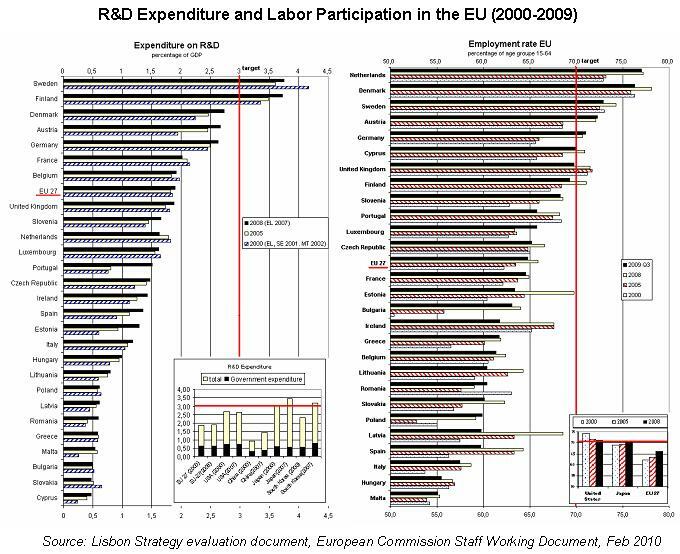 Finally, under current dire fiscal conditions in Europe’s debt-ridden periphery it is probably difficult to allocate 3% of GDP to R&D. Even if this is possible, R&D as a percentage of GDP might result in a meaningless number in absolute terms once applied over an already low GDP number. Three percent of a low GDP economy, might not yield the same results as three percent of a much larger GDP economy. It might simply not be sufficient for meaningful research to be carried out these days, especially when a low productivity country is struggling to catch up. For example it may be required to pay comparatively higher salaries to attract researchers to relocate there. Mutual recognition of diplomas that is proposed under the Pact can increase mobility but the real factor for that is employment opportunities; human capital will flow to where opportunity lies, causing underdeveloped regions a “brain drain”). Going back to the Pact: what is then trying to achieve when it comes to labor cost? 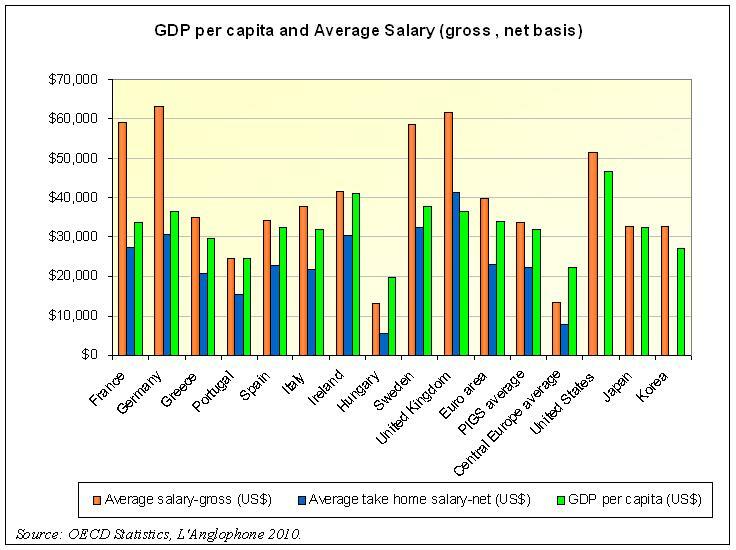 In a typical European state run economy the public sector sets the stage for salary levels; these salaries may be even higher than those in the private sector due to collective bargaining or other inefficiencies. The consequence is that there’s limited propensity for people to “go the extra mile” once there’s secured and descent income in the public sector. That results in an inefficient, marginal private sector that is unable to compete internationally and lead countries out of the crisis. Since the corporate sector is not competent enough to productively invest in R&D; the government should again step in to support such efforts; a vicious cycle. By lowering salary levels we are simply continuing to produce the same albeit at lower cost. Sounds like a typical Porter’s Cost Leadership strategy for those familiar with management literature; or referring to a newer terminology a “Red Ocean” doom. When applying this strategy the objective is to outperform the rivals in capturing a larger share of an existing market; in which case competition turns bloody. And you know the surest way to go broke? Keep getting an increasing share of a shrinking market. Down the tubes. Slow but sure. Then you might wonder what market is European periphery competing in? Without getting into detail, economies are not that extrovert, they are more into services. In whatever they produce there are other countries that have far lower cost structures and will continue to do so for the foreseeable future. In the absence of higher value added output the proposed Competitiveness Pact seems like an attempt to perpetrate the same model in the South albeit at lower cost; a losing strategy not to mention the social and wider economy consequences of that. Even China has recently outlined plans to move from low cost production to high technology and new energy. US has made that shift long time ago with clear indications that the workforce should be retooled and education geared towards science and technology. So is this Competitiveness Pact simply a damage control exercise? ie solidifying a Euro nanny-state where the periphery will be at perpetual life support/lower gear compared to developed EU states? There can be another explanation right out of the Austrian School of Economics though: by lowering wages and increase unemployment through structural reforms a creative disruption might be created that will force unleash the economy’s potential to grow out of the crisis. Based on the above, this sounds like a risky strategy if not wishful thinking. Societies can’t jump start or adjust to new circumstances quickly; it would have been nice but can’t redeploy the workforce in new sectors. As the saying goes: “can’t teach an old dog new tricks”. Have to invest in education and transition over time to avoid social crises. D.	So where’s the solution? The Blue Ocean? There are various ways to represent risk created by debt. Leverage can be quantified by the ratio of debt to GDP or debt to national wealth (problem is that the latter is difficult to measure). On the other hand the risk of debt servicing (liquidity risk) can be represented by the interest expense to total income. A country might be highly leveraged but at the same time might have significant property or ability to increase income (increasing taxes or curbing tax evasion being one). The most commonly used leverage ratio of debt to GDP (solvency ratio), can be reduced by reducing the nominator (debt) or increasing the denominator (GDP). Ruling out bankruptcy as a solution, which wouldn’t benefit anybody (bondholders, Eurozone countries or global markets, even recently US expressed their concern over that), public debt can be reduced over time by cutting down deficits, restructuring the debt to lower interest expense or buying back some or spin it off through privatizations. Austerity can have its limitations though: after two years of austerity that caused the economy to contract, Ireland saw its deficit to increase and is realizing its bailout program might be unworkable. It now aims to renegotiate terms. Same might happen elsewhere. Leverage can on the other hand be reduced by increasing GDP. Growth is of paramount importance not only to decrease that risk but also to ensure long term prosperity and competitiveness in today’s globalized economy. In other words, instead of a Cost Leadership strategy that would aim to reduce debt (ie the ratio’s denominator) the solution could be growing out of the crisis (increasing GDP, the nominator) by diversifying into new markets and high value added products. These new opportunities are called Blue Oceans under the respective strategy model. To enable such transformation it would first be useful to remedy structural problems to provide the necessary breathing room for the private sector to flourish. Then the question would come to which industries to invest in? 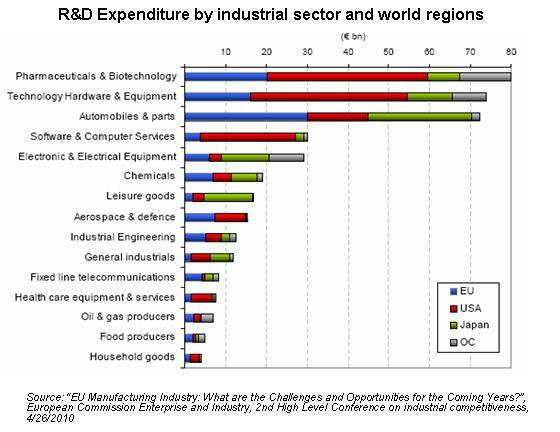 Looking at R&D expenditure around the world it seems that EU is investing proportionately more on pharmaceuticals, automobiles, aerospace, chemicals and communications. This is not coincidental; there are many dominant companies in these sectors, mainly in Northern Europe. On the other hand the US invests proportionately more on technology and software. Europe’s periphery, apart from Spain, lacks to a large extent heavy industry. Therefore it would be wise to invest in less capital intensive industries such as software or niche technologies, even services (why not some outsourcing as well; there can be opportunities in certain niches). Ireland is following this path. Green technology is another sector that can be developed which brings the additional benefit of reducing imports. Finally, going back to the decoupling argument, this investment could also have a positive effect elsewhere: considering the high growth and overheating of the German economy it could be possible to transfer certain production and research to the South and provide employment opportunities for scientists and professionals there. The European debt crisis as a foreign exchange control mechanism! What has long been discussed as a rather cynical point of view among many, it was recently openly admitted by Germany’s Finance minister Wolfgang Schaeuble at an interview to the Focus magazine. There Mr Schaeuble mentioned that Greece’s exit from the Euro would lead to Euro appreciation and eventually hurt German exports. Despite of public and political concerns in Northern Europe, Euro’s relative weakness benefits Germany’s exports and strong rebound. At the same time healthy European economies can take their dividend from lending to the periphery for a markup through the EFSF/ESM facilities. Mr Schaeuble is among the European politicians with the more sound positions regarding the European currency and governance, expressed throughout the crisis. He underlined long ago the need for a common fiscal policy to support the Euro, something which is challenging under EU members’ current governance regimes. It is long overdue though and would have averted excesses in certain countries should it have been in place or if effective supervision was exercised by EU mechanisms. Maybe a crisis was needed to bring about this change. Now a much needed support to debt ridden countries through debt buyback and rescheduling using the EFSF or ESM facilities could only be given the go-ahead pending acceptance of the proposed European Competitiveness Pact; what has bluntly been called by EU officers the “Great Bargain”. We will revisit the European Competitiveness Pact as more information become available. At this point it seems however that fiscal measures included there cannot alone solve EU periphery’s developmental problems. More far reaching structural reforms and investment in innovation is needed for that. Maybe this will be the next centrally designed policy plan to be introduced on the back of a future crisis, once fiscal policy has run its limitations and can’t respond to employment/growth needs. Or, are we aiming for a Euro nanny-state where the periphery will be in perpetual life support/lower gear compared to developed EU states? EFSF and country bailouts: the European TARP or something more? The EFSF (European Financial Stability Facility) is a special purpose vehicle that was created last year in order to provide support to troubled European economies. EFSF can issue loans backed by EU country guarantees and IMF loans. A maximum of €750 billion can be raised under the current agreement although much less will in order to keep its AAA rating. EFSF’s creation was shadowed by market turmoil and public unrest. However, half a year later, it starts to show how an important tool can be for the European Union. According to its operating guidelines EFSF can provide loans to eurozone countries, recapitalize banks or buy sovereign debt. In EFSF’s first band issue as part of the EU/IMF financial support package agreed for Ireland €5 billion were raised at 2.89% which will be loaned out to 5.8%. Not that bad deal after all for the Eurozone. And in the meantime the whole crisis devalues the Euro much to the benefit of the export-driven European nations. No much doubt that the facility can be increased if need to take more economies under its wings. Although this European “bailouts” seem to face some political headwinds they make economic sense. On the other hand isn’t the EFSF effectively becoming the financing arm in the course of shaping a rather “invisible” common European economic policy? Countries that request support have to align their policies under IMF/EFSF guidance; the ones coming under the EFSF being probably are the ones that have lost their credibility. To take it a step further, isn’t the latest bond issue a type of Eurobond that so much discussion have been made about lately? Eurobonds may be some years away; in the meantime Germany and other healthy economies are keeping their financing ability and rating intact. But let’s go back to the economic consequences from EFSF’s actions. In the European setting, buying back government debt, the “toxic assets” behind the European crisis, pretty much means recapitalizing the banks. European banks hold much of the European debt; they mostly had to, under the European economic model. That’s the case with the Greek debt held by large European banks and all of Greek banks. Restructuring Greek debt to 50% of face value, as current market valuations imply, would decimate the Greek banking system requiring massive recapitalization for its size to satisfy capital adequacy guidelines. One objection here would be that Greek banks hold most of the debt in their investment portfolios i.e. at book values so they might seem indifferent towards a buyback in the wake of having to take losses. Even so though, the main problem is that their market capitalization has evaporated during the crisis as well as their funding capability. In this way the EFSS buyback can free up capital to finance economic growth and push back the “toxic asset” issue: effectively growing Europe’s way out of the crisis. Isn’t this what TARP meant to do? I guess the main issue would be the timing of such buyback and be the haircut. Probably this couldn’t happen earlier than market reforms have been implemented. In the case of Greece this will happen after the first half of 2011. As regards to the haircut, certainly this should be lower than the 50% markets imply for Greece. Probably, somewhere in the 25% range, considering recent rumors and the target effective government borrowing after refinancing at lower rates (discussions are for 25% discount on 15-20% of debt outstanding). Some might say that this would still maintain a high, not manageable, debt level for Greece. However should it starts growing again with a sound plan, which should be the main concern., and manage to get its finances in order by reducing useless, unproductive spending and get tax income finally flowing in, then, it will be able to serve interest payments. For those in doubt mind that this time the whole process is administered by the IMF/EU. As regards to the debt/GDP ratio this is only an indicator; it’s probably more useful to focus on the interest/GDP indicators. Furthermore one has to consider the country’s true wealth, what that actually should be for Greece considering its stealth economy? In the end Greece was surviving with 100% debt/GDP for years as did Italy or Belgium without raising concerns. On the other hand: maxing up your credit card makes you more conservative as a buyer or at least limits your options….. So not bad as a self-restraining measure. This will be a good lesson; but will need some time to sit in with the people. After all: Every cloud has a silver lining or from another view “You never want a serious crisis to go to waste”. I see the European stockmarkets, especially those of the PIGS to move lately. Would they know something? US December jobs report: lower than expectations, yet again good news; turning point with a twist.. The US private sector added 113,000 jobs in December according to the Department of Labor; 297,000 according to ADP. Seasonality might be the reason for the disparity; I believe that the two numbers will converge as seasonal adjustments kick in during the next months. The focal point should be that unemployment decreased to 9.4%, the lowest since May 2009 (which I believe was the point in time that US economy adjusted to the post-crisis level of economic activity). Therefore, at this point the economy has to deal with structural unemployment created from jobs lost in specific sectors over the years that found a way to materialize during the crisis. Unfortunately most of these are not coming back, and unfortunately the long term unemployed are not going to get back to work easily. So it’s not myopic to focus on the unemployment rate. Since employers won’t hire somebody who is long term unemployed or in a diminished job sector, that means that for the ones with a job things are getting better. This will lead to salary and price inflation and progressively erase negative mortgage values and low real estate prices (all right I’m not forgetting lower consumption and consumer credit due to unemployment but even if some people get back to work the benefit would be marginal considering their probably reduced wages or low spending). At the same time long term unemployed will have to be supported by the state increasing federal spending and deficits, hence more inflation. Well, this is not going to be good news for the high net worth individuals but one can’t have it all. Probably this is the milder way out of the crisis; without seemingly taking tough decisions. One however can’t help but ponder over the long term unemployment issue. As the economy seems to be doing pretty well without them as indicated by corporate profits and the stockmarket; this probably turns to be more of a social issue. Europe is able to function pretty well with 10% or even higher levels of employment. However Europe operates under a much different social and economic model that allows this type of phenomena. Also wanted to note the fallacy of trying to address current economic problems with recipes of the past when markets were not globalized. Right now lower interest or tax rates won’t necessarily lead to investment in the US because for a global firm it might be advantageous to do so somewhere else. The jury is still out on how economies will adjust over these circumstances but for the time being let’s stay with the positive note on the latest jobs report.